Earn $1.51 in VIP credit (151 points)What's This? 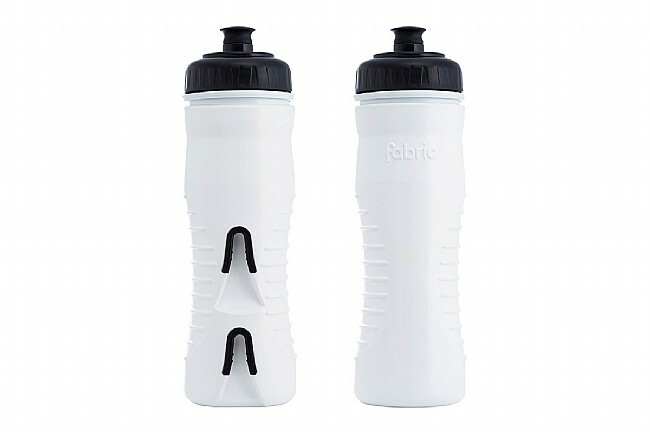 Fabric's Insulated Water Bottle uses a double-walled foil construction to keep contents warm or cool. It mounts to the included cage-less bottle bolts that simply allow the bottle slide securely into place without needing a bottle cage. The result is a minimalist look and a substantial weight savings. BPA-free. 18 oz volume. Cage-free mounting bolts included. Nice lightweight bottle that easily slips in and out of the holder. I use it on my road bike. Easy to get in and out of the knobs that go in the braze ons. Haven't bounced it off once. Just got to make sure it is pushed down. Lightweight and easy to use while riding. Unfortunately they bounce off when you hit large or many bumps. Will try some tape to tighten. These Fabric Water Bottles are terrific so long as you secure them correctly. They don't require a cage and are insulated so that they keep drinks cold for several hours. Insulation keeps water cold a very long time. Look on frame gives bike a sleek, modern look.